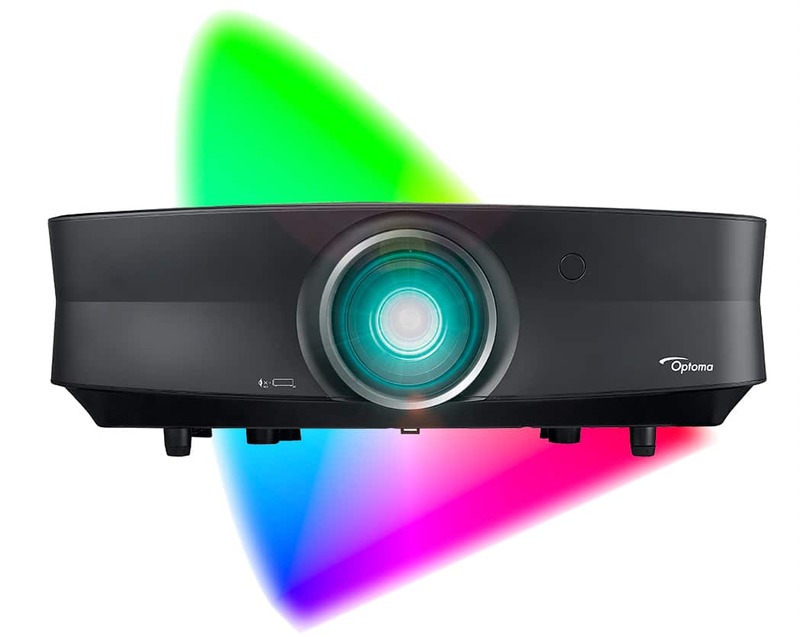 Salt Lake City, November 19, 2018 – TVS Pro, a family owned corporation, today announced the Upgraded UHZ651 4K laser projector with significantly improved color and black level performance. Building on the success of the Optoma UHZ65 laser projector, the modified version takes 4K HDR content to new heights of visual quality for home theater, simulation, post production, and 4K screening applications. 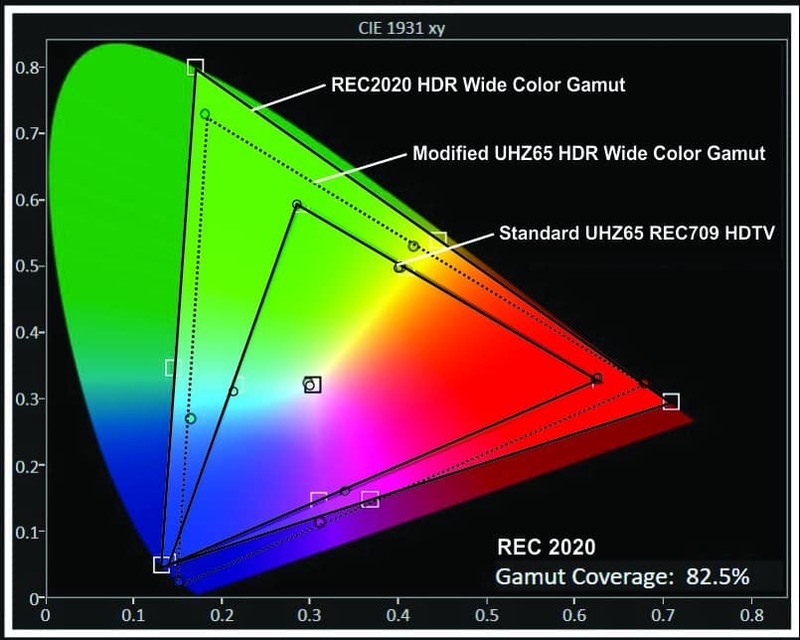 Utilizing a custom engineered PureChrome©* ultra-efficient cinema filter and optical modifications, the Upgraded UHZ651 is able to achieve up to 80% of the elusive but dramatic BT2020 HDR wide color gamut compared to 60% for most lamp-based projectors. Unlike other 4K projectors with conventional cinema filters the PureChrome©* Cinema filter used in the modified UHZ65 is able to produce up to 2,400 lumens and wide color gamut simultaneously due to the high efficiency of this new filter design. In addition, the modification includes improvements to low level blacks and overall black levels for a richer more dramatic cinema experience especially when coupled with the wide color gamut as found in 4K HDR content. The Upgraded UHZ651 projector is individually calibrated with settings for REC709, DCI P3, and BT2020 thus enabling optimized playback for off air broadcasts, HD Blu-Rays and 4K HDR Blu-Ray discs. Unlike traditional lamp-based projectors which can lose up to 30% of their light output in just a few hundred hours of use, the ultra stable laser light engine in the UHZ65 maintains most of its light output and color balance over long periods of time and is usable up to 20,000 hours of use. There are also no filters or lamps to change or replace – so the projector is virtually maintenance free. Utilizing HDMI 2.0 and HDCP 2.2 the Upgraded UHZ651 is also able to support a full 18Gbps input for the ultimate in video bandwidth, image quality and device compatibility. The included PureMotion©** technology provides dramatically improved motion for live TV, sports and live gaming in both 4K and HD sources. For those who desire the use of a 3.40:1 native aspect screen to avoid the black areas above and below the image, the projector includes the capability for use with or without an anamorphic lens to achieve this capability. Prices after December 23rd, 2018, will change to $5,499 for the new Upgraded UHZ651 and $1,499 for the Retro modification upgrades if the original was not purchased from TVS Pro and $1,299 for Retro modification upgrades if purchased from TVS Pro. TVS Pro is a division of TV Specialists, Inc. and was founded in 1953. It is one of the leading AV dealers in the western United States and is known for product innovation, service and support. It specializes in professional digital cinema cameras, lenses, custom integration, control systems and professional display systems including laser projectors, video walls and custom programing. For more information call TVS Pro at 801-486-5757 or visit www.tvspecialists.com. This entry was posted in AV Solutions, General News and Updates, Home Theater and tagged BT 2020, BT2020, optoma uhz65, Upgraded UHZ65, wide color gamut. Curious if you will also create a graphical THEO-Chart for the upgraded UHZ-65? I used the graphical information for purchase comparisons among models. It would be interesting to see that against UHZ-65 and others even though you can read and make your own comparisons. Yes, I believe it’s being worked on. I’ll double check and/or ask for it. I just checked and we should have it up by middle of next week or end of the week. Our Theo Charts have been modified a bit to show more detail and how scores are calculated. It also looks like the older Theo Chart for the UHZ65 didn’t take into account the key features as much. We will be updating that page, but for now, here’s the Theo Charts for the Upgraded UHZ65, the original UHZ65, and one with them overlapped so you can see the comparison directly. These will also be posted on the blog we are working on to go along with the latest video. I have question, Price of UHZ65 $3,799. and the modification price is $ 999.00 will comes $4,798.00, doesn’t it? Is the product different your modifcation product $4999.00? The price of the UHZ65 at $3,799 is the original, unmodified version from Optoma. The Upgraded UHZ65 is a modified UHD65, as described above, that we, at TVS Pro modify ourselves to enhance the original projector. The $999 price is if you already have a UHZ65, was originally bought from us, and you want to have it upgraded (It needs to be sent to us). However, we also sell the projector with the new modification. So, there are 3 options: 1 is purchasing the original unmodified UHZ65, 2 is upgrading an existing UHZ65 that has already been purchased (there is different pricing if the projector was originally purchased elsewhere, than if originally purchased from us), 3 is the option to purchase the UHZ65 with the upgrade modifications. Note that we have worked with Optoma on this custom modification, and it will not invalidate the U.S. warranty – but we would need to know about the issue first. Please see the next blog post for additional frequently asked questions (FAQS0.